Jaded Bayou moves from the aqua-chocolate pallet into cleaner blues. The soft, calm pallet was derived from the natural elements of sky and water, offering a healing and restful appeal. Perfect for clean and sophisticated designs, this pallet has found a home in coastal art. As the pallet has become more popular, it has expanded into abstract art and other art employing a comfortable, retro feel. 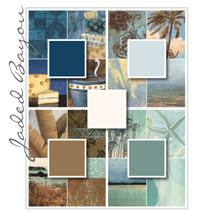 Jaded Bayou works well in both traditional and contemporary designs due to its strong cross-generational appeal.